Description: Former Chessie System unit sits by the yard office while crew gets their paperwork together for today's run south out of Spartanburg, SC. Description: Ancient Chessie pulls tie train w/caboose! Description: CSXT 5572 is seen at Elsmere, DE. Unit is ex C&O 8290. Description: Union Pacific 5760 (Former Cotton Belt GP 60 9658) leading an intermodal near the crest of the grade on Beaumont Hill along with two CSX units. 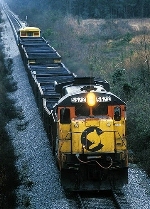 Description: CSX B30-7 5572 going through the yard at Manchester, Ga. Description: The Kennesaw local, A706, breezes by the old NC&StL caboose in Acworth. Description: F788 has put his train away in the S-End of Cayce yard and is waiting a taxi to carry the crew up to the office. Description: B30-7 5572 pulls a southbound local into Cayce Yard.